No technology is a great way to teach. Also, PowerPoint is more than two decades old. It doesn’t count as technology anymore. Rebecca Shuman of Slate writes about the benefits of a low technology classroom, despite complaints by some students that they are not being prepared for a world in which technology is a dominant an essential force. "While exceptions exist, research shows again and again that when people are staring at a screen, or skip-jumping through a bajillion websites and apps, they are not learning well. Yes, college students are adults, and if they choose to spend class on whatever the new thing to replace Snapchat is, that’s their prerogative—but when it comes to course design, it is still the professor’s job to prioritize student learning." I teach storytelling to adults on a fairly regular basis, and recently, I conducted a series of workshops for teachers as part of an educational conference. In both instances, I was contacted by the conference facilitators and asked what my technology requirements were. “Not even a PowerPoint?” one of the facilitators asked. In truth, there are times when I will utilize PowerPoint (and some of the other technology platforms that Shuman mentions in her piece) in my teaching, but only when it is absolutely necessary, which means almost never. Technology for technology’s sake makes no sense to me. Adding bells and whistles to something better done with pencil and paper only interferes with what is good and right about teaching. Besides, most PowerPoint presentations are so poorly designed and utilized so ineffectively that they do more harm than good. I explain to my adult students that I want to engage them in dialogue and discourse. Make continuous eye contact. Utilize nonverbal signaling. “Let’s spend the next hour nodding and smiling and furrowing our brows at one another,” I recently suggested to a group of students. I want them to engage with me. Not my slides or my handouts. I also understand the value of note taking. I know how it increases efficiency and effectiveness of learning. Just the act of writing down of a piece of information helps the learner retain that information, but note taking also forces learners to prioritize, organize, and systematize information as it’s being delivered. All of this increases understanding and retention enormously. So I tell my students that if they want to take notes, that’s great. Go for it. Sometimes I even talk about the benefits of note taking. But I also tell them at the end of my class or workshop, I would also be more than happy to send them my notes via email, thus releasing them from this burden as well. All I really want is for my students to listen, respond, question, and engage. Be fully present in the moment. Not staring at a screen or looking ahead on an agenda or flipping through a handout. Just be with me for the short time we have together. Perhaps it’s the storyteller in me. Since I teach through story almost continuously, my instinct is to find a way to engage my students and convey information and understanding through character, plot, humor, and an emotional appeal. 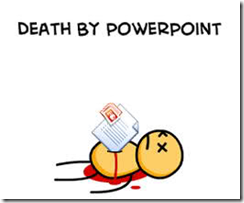 Nothing can ruin a good story faster and more completely than a PowerPoint presentation. And based upon the feedback that I receive, both formally and informally, I am doing something right. I consistently receive high marks from my students, despite the absence of any material other than me and my voice. I have never been asked to use more technology in my instruction. I have never been asked to hand out notes, outlines, or even an agenda beforehand. My workshops are always well attended, and students actively participate throughout. It’s old school. Even older than PowerPoint. It’s one person who knows some stuff imparting his wisdom upon a group of people who don’t know that same stuff or don’t know it was well. It’s stories and anecdotes. Questions and answers. Call and response. It’s fun. And when students are having fun, they learn.